Has the Age of the Robots Arrived? A new report notes that robots cost less and are able to do more--and that their use in manufacturing will quickly grow. 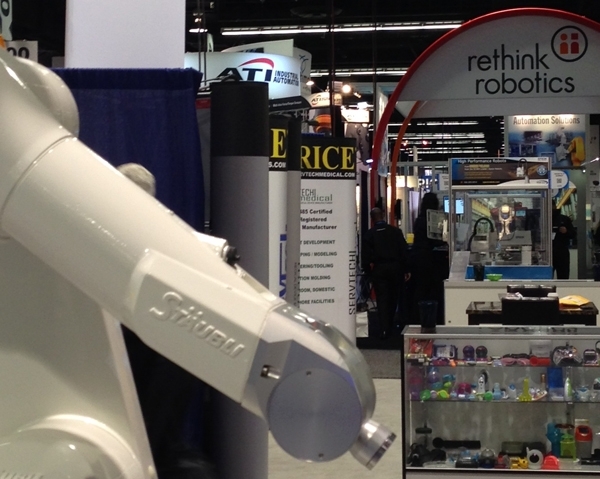 The growing importance of robots in device manufacturing was evident at MD&M West in Anaheim, CA, this month. Robots presently perform only 10% of manufacturing tasks, but that is expected to rise to 25% by 2025 as robots become more affordable and able to perform more tasks, according to a recent prediction from the Boston Consulting Group. Already, the cost of an advanced robotic spot welder has plunged 27%, from an average of $182,000 in 2005 to $133,000 in 2014; it is expected to decrease another 22% by 2025, according BCG. Meanwhile, the speed and flexibility of robotic systems is expected to continue improving about 5% a year. "Within five to 10 years, the business case for robots in most industries will be compelling, even for many small and midsized manufacturers," Michael Zinser, a BCG partner who co-leads the firm's manufacturing practice, said in a news release. The announcement from BCG did not specifically mention medical device manufacturers. But the medtech space certainly is looking for more cost-effective ways to deliver features, as changes in the ways health providers are paid are causing them to seek more value out of products. The BCG report notes advances in vision sensors, gripping systems, and information technology that are driving improvements in price and performance. Robots are becoming smarter, highly networked, and able to perform a wider range of applications. Robots can also be reprogrammed faster and more efficiently than humans can be retrained when products are updated or replaced, according to a separate RBC Global Asset Management report cited by The Associated Press. At Boston-based Rethink Robotics, for example, software upgrades are allowing the company's Baxter robot to perform some tasks at less than half the time from two years ago. "We have developers coming up with software that enables Baxter to do things we never dreamed of," Carl Palme, product manager at Rethink Robotics, told Qmed in September. Robotics advances could enable manufacturing labor costs in the world's largest economies to be 16% lower on average than they otherwise would be by 2025, according to BCG. Could robots end up threatening manufacturing jobs in the process? Officials at Rethink argue that the Baxter robot is so adept at collaborating with human workers that it can actually be used to help human workers become more effective. "You liberate the skills of your employees while the robot does boring monotonous tasks," Palme said. Toyota has actually been bringing more humans into the mix to work alongside robots, leveraging their creativity and problem-solving abilities to progressively optimize their manufacturing operations. The International Federation of Robotics (IFR) predicted in 2013 that robotics in industry would create 2 million jobs worldwide over eight years. The argument behind the report was that automation increases competitiveness and creates new downstream jobs.